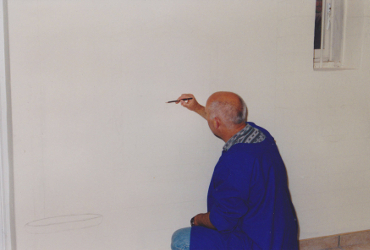 If you have searched for "Buy wall mural" and live in the area of Swindon Wiltshire, you have found the page you need to commission an experienced mural artist in the area. 3D mural artist Stephen Lewis Gilmore can be commissioned for interior design work in restaurants, other public areas and to create artwork to provide you with truly unique home decoration. S Gilmore, the artist, lives in Swindon Wiltshire. 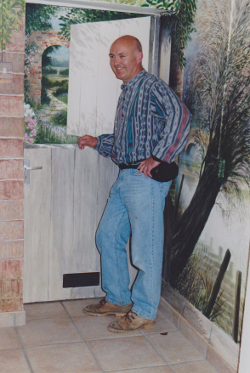 He will consider mural commissions in Wiltshire, Oxfordshire, Berkshire and Gloucestershire. Marlborough, Chippenham Cirencester and Oxford. 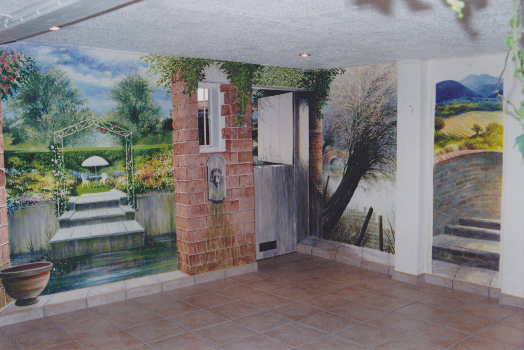 The following shows an example of a 3D mural for interior design in a private home. 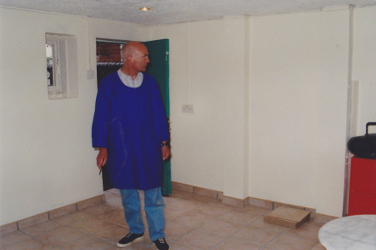 Before the mural artist starts work - the bare walls! Below: the mural artist plans the job. He decides how to incorporate the existing features into the final 3D mural. This is truly bespoke interior decorating. The art is tailored to the space available to provide unique and individual home decoration. Notice the row of brickwork at the base of the wall. Carry on reading to see how the artist incorporates it into the final wall mural design. 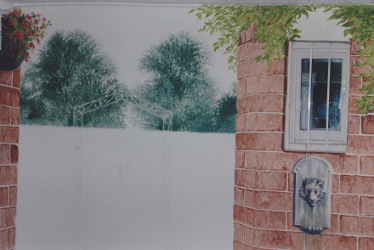 Below: the wall mural part way through. Below: the mural artist leans on the non existent open gate in the 3D mural. 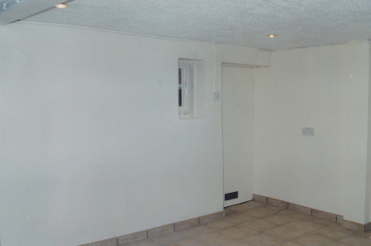 Look at the "before picture" to see the contrast with the original plain white door. Below: One wall of the finished wall mural. Note the 3D effect - the window is really there. But the rest is a flat wall. Below is a full view of the finished wall mural. Interior bespoke decorating can change the feel of the space dramatically! The 3D effect gives a sense of greater space. Sit in your house and be transported into the landscape outside. 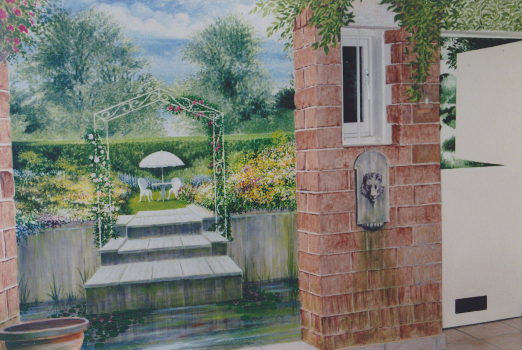 Notice how the artist has included the actual brickwork at the base of the wall into the wall mural design. The plain door has been transformed into an open gate door. The above wall mural was painted by mural artist Stephen Lewis Gilmore. Buy wall mural: Contact Stevie via this website. You can buy a mural from Stevie if you live in Wiltshire. Swindon is also close to parts of Oxfordshire and Berkshire. Stevie may also be available for mural commissions in these locations depending on travel times. Wall mural paintings in destinations further away will only be possible if accommodation is provided or allowed for in the costing. Any additional costs of travel will also be considered in the quote given. Click here for another example of a 3D mural and for details of the information Stevie will need in order to provide you with a quote for the work. Tags: Muralist, mural artist, anamophic art, Wiltshire, Oxfordshire, Berkshire Gloucestershire.Marlborough, Chippenham, Cirencester, Oxford. Many thanks for visiting Original Art Paintings. Please take a look around the website to see other examples of the original art of Stephen Lewis Gilmore.